February 12, 2019 – On a glorious warm winter’s day last week, twenty people, ranging in age and backgrounds, came out to volunteer with the Bear Yuba Land Trust (BYLT) to continue the organization’s collaborative efforts with the City of Grass Valley to build a trail near Wolf Creek. Volunteers were briefed on the vision for the trail, along with the day’s tasks to remove rocks and blackberry bushes; level, grade or build up the single-track trail, and shown how to use the provided tools of a Pulaski (a cross between a pick and an axe used in excavation) and a Mcleod (a two-sided rake/hoe). 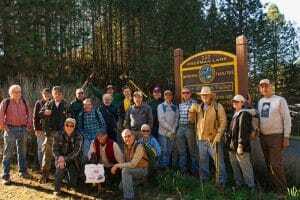 Four hours later, volunteers stopped for lunch to enjoy the quiet pastoral setting and for a chance to marvel at the section of trail they had just built together as a team, that will be enjoyed by trail and outdoor lovers for many years to come. INFO: Call (530) 272-5994, email Felicia@BYLT.org or sign up at https://www.bylt.org/events/event/volunteer-orientation/.